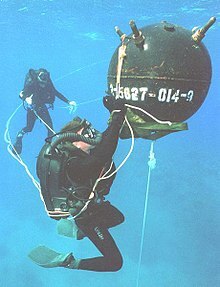 For a long time[clarification needed] navies used the heavy standard diving dress for underwater work. During and after World War II some of them started using frogman-type gear when frogman's kit became available. Later they started often using open-circuit scuba gear for work diving. The French Navy clearance divers are known as plongeurs démineurs . The French Army has clearance divers as well named plongeurs de combat du génie. To avoid redundancy, they only operate in freshwater environments. Although they are trained in demolition and explosives clearance, they also survey banks and possible crossing areas, and may make offensive interventions. During WWII they at first[clarification needed] often used the Davis Submerged Escape Apparatus and no diving suit, and no swimfins and they swam by breaststroke. Southern Diving Units 1 and 2 and Northern Diving group. These units provide 24/7 domestic bomb and mine disposal and IED disposal cover. SDU1 covers the South West of the UK. SDU2 covers the South East of the UK, and Northern diving group covers the North, including Scotland and Northern Ireland. The units operate exactly like their counterparts from the Army, with the added skill set of being able to deal with water based munitions. Fleet Diving Group, made up of Fleet Diving Units 1, 2 and 3. Each unit requires new members to undergo further training depending on the specialisation of the unit they're joining. FDU1 provides an elite team of Clearance Divers that works alongside UK Special Forces (UKSF). New members are trained in Parachuting, maritime counter terrorism (MCT) tactics and SDV operations. FDU2 comes under 3 Commando Brigade, and specialises in Very Shallow Water (VSW) beach reconnaissance operations. New members to FDU2 receive further training in VSW operations tactics. They are also required to complete additional weapons training, and Survival Evasion Resistance and Extraction (SERE) training that culminates in a resistance to interrogation phase. Members of FDU2 train and work regularly with other specialist elements from the UK and foreign militaries. FDU3 are the deep water warfare unit and specialise in dealing with modern enemy sea mines. FDU3 members will also regularly cross train with FDU2 and receive the same additional training as their team 2 colleagues. Throughout their careers Clearance Divers will serve on a number of, if not all of the diving units within the branch, gaining a wide range of experience to take from team to team. Clearance divers have been involved in every major British conflict since their inception and have most recently deployed teams to Iraq, Afghanistan and Libya. They have units operating permanently in the Middle East and have continuously provided an Underwater Force Protection (UWFP) element since the September 11 attacks. Training to become a Clearance Diver is notoriously arduous and lasts around 7 months. The course has been known to have a 100% failure rate in the past, though usually around 40% of trainees will make it successfully through to the end. Before prospective trainees are accepted onto a course, they must pass a week-long diving aptitude selection, held at the Defence Diving School, on Horsea Island, Portsmouth. This selection involves first of all passing the Divers Physical Fitness Test (DPFT) on day one. The rest of the week then involves numerous tests of physical and mental endurance, including circuits, mud runs and surface swimming. The candidates are also introduced to the Royal Navy's Swimmers Air Breathing Apparatus (SABA) set, and complete numerous dives in Horsea lake, including night dives in low to zero visibility. Those that make it are then put into a pool of candidates and will be given a course start date. Due to the large physical and mental pressures brought on by military diving, the failure rate on the aptitude has been historically high. Owing to this high attrition rate the branch started a three-day Pre Entry Diving Acquaint (PEDA), which allowed civilian candidates to attend Horsea Island and undergo physical and mental tests to give them a better idea of the training that lay ahead of them before they had actually joined the Royal Navy. ^ Goble, Steve (2003). "Rebreathers". South Pacific Underwater Medicine Society Journal. 33 (2): 98–102. Retrieved 2009-03-20. ^ [www.amazon.co.uk] Book description: Clearance Diving in the Royal Navy, including their work during the Falklands war.